A team of volunteers will soon begin combing the woods of Northern Minnesota, setting out "emergency" food for whitetail deer, who are experiencing a particularly rough winter. Hunters are reporting that deer are dying from lack of food, so people have stepped in to help them out. Officials say that 130 people, most on snowmobiles, have already signed up to help, with one even offering the use of his warehouse and another offering an airplane for delivery from above. The effort will feed 12,000 to 16,000 deer and will last until the snow melts and the first green vegetation appears, according to Minnesota's Pioneer Press. This will be the first time since 1997 that Minnesota has embarked on an emergency deer feed. 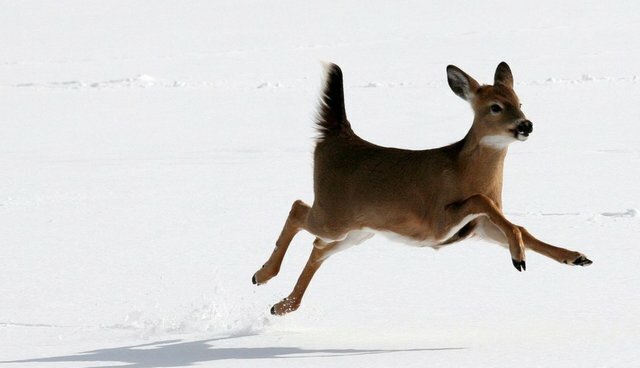 It's the result of pressure from deer hunters who note that the severe winter likely is killing deer in areas where the population is lower than goals set by the Minnesota Department of Natural Resources. The DNR was brought on board reluctantly. The agency opposes the practice, arguing it doesn't have a significant effect on the larger population and can congregate deer in ways that can encourage the spread of fatal illnesses such as bovine tuberculosis and chronic wasting disease. Officials decided that the winter was bad enough to warrant feeding the animals -- a fund was created for the purpose after severe winters in the 1990s, with 50 cents of each deer hunting license going toward it.